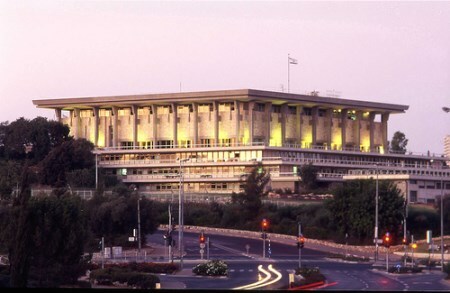 Israel’s Knesset. The parliament of a banana republic? My intention was that I have deep differences with the Reform movement about practical matters related to Judaism. At the same time, considering that we are all Jews and members of the same religion, we need to solve these differences in discussions and conversations around the table. I apologize to anyone who may have been hurt. I am not going to become involved in the discussion of whether Reform Judaism is “another religion” from traditional Judaism. Obviously there is a point when a ‘denomination’ becomes a different religion. Many people, myself included, think that “Messianic Judaism” is more a form of Christianity than a form of Judaism. It has been argued that Chabad — or some factions thereof — have gone too far in their adulation of their Rebbe. I am really not going to get involved in this. What I do want to discuss is the increasing pressure on Israel from liberal American Jews in regard to the place of Judaism, in all of its forms, in Israel. The New Israel Fund, a US-based group (which, by the way, I regard as anti-Zionist and pernicious), has long funded Israeli organizations promoting “religious pluralism,” which means equal treatment of various forms of Judaism, equal roles for women in every aspect of Judaism, the elimination of the Orthodox Rabbinate’s control of family law, etc. The Union for Reform Judaism (URJ) — massive in the US, small in Israel — has pushed for full recognition of non-Orthodox conversions in matters of marriage and divorce, as well as state funding for non-Orthodox rabbis (a limited victory was recently obtained in Israel’s Supreme Court). The head of the URJ, Rabbi Richard (Rick) Jacobs (more here), was a member of the NIF Board of Directors and chair of its Pluralism committee until taking the reins at the URJ. Civil Society: a third initiative, still being refined, which will most likely relate to religious diversity and civil marriage in Israel. The task force has hired a consultant in Israel to make recommendations on how the GPT could achieve impact in this area. What I want to say about all this is not that their goals are necessarily wrong. I can certainly tell you from personal experience that immigrant Jews can have a very difficult time establishing their Jewishness before the Rabbinate in the event that they want to be married in Israel. This is a huge problem for immigrants from the former Soviet Union, where WWII and Soviet anti-Jewish attitudes caused Jewish records to be lost. First, most American liberal Jews really don’t have a clue about either Israeli life or the complexities of Israeli politics — in which these issues are deeply entangled. They don’t understand how the changes they are proposing will affect Israeli Jews, nor are they aware of possible unintended political consequences. Second, it is really none of their business. They are not affected by actions that might be taken in Israel as a result of their pressure. If they move to Israel where it might matter for them, then they can vote for Israeli politicians that reflect their point of view. This is not different in kind from the pressure that is exerted on Israel, via the European funding of left-wing organizations, to make dangerous concessions to the Palestinians. It is not the Europeans that will become the targets of terrorist rockets from Judea and Samaria after an IDF withdrawal! Both the Reform Movement in Israel and the URJ [in America] condemned Rotem’s statements and asked Knesset Speaker Yuli Edelstein to punish him. The leadership of the Conservative movement and Anti-Defamation League also chimed in. I’m sorry, perhaps this is just the way the particular reporter is describing it, but isn’t there something inappropriate about Americans demanding that a member of Israel’s Knesset be removed from his post to punish him for insulting them? Can you imagine an Israeli organization calling on the US Speaker of the House to take away the committee chairmanship of a member of Congress? Israel is an independent sovereign state, and it should not be treated as a banana republic — not by President Obama, not by the Europeans, and not by the URJ. Satellite communications, the Internet, even cheap air travel have brought our society face to face with the Muslim world in a way that we couldn’t have imagined as recently as 1960. The issue of how we, Westerners, Christians, Jews, ought to deal with our meeting with this almost wholly foreign portion of humanity literally exploded into our consciousness in September 2001. Today, with the worldwide Muslim fury associated with (or taking as a pretext) the Innocence of Muslims video, we see that nothing has been settled. Attitudes in the US are all over the map, from those who think that the problem is that our right of freedom of expression makes it possible for ‘intolerant‘ people like Nakoula Basseley Nakoula to provoke violence, to those who think that it is the Muslim propensity for violence when insulted (and it’s so easy to insult them) that is important. The official response from our government has of course been to condemn violence. This is usually joined with a statement that while we find ‘denigration of any religion’ distasteful or worse, we can’t interfere with it (although we should note that Nakoula has been jailed for violating a — ridiculous — condition of parole forbidding him from using the Internet). These ads immediately provoked (are you surprised?) Muslim and ‘progressive’ outrage, and were immediately defaced. After all, vandalism (and assault) are considered by this crowd to be legitimate responses to expressions of ‘racism’, by which they seem to mean anything that offends Muslims. [The word ‘savage’] is entirely apt. 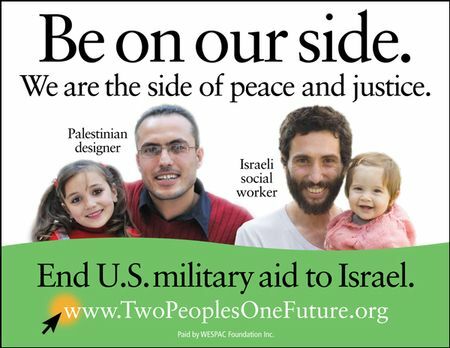 They claim that the ad refers to all Muslims, or all opponents of Israel. It doesn’t. It refers to those who rejoice in the murders of innocent civilians. The war on Israel is a war on innocent civilians. The targeting of civilians is savage. The murder of Ambassador Chris Stevens was savage. The relentless 60-year campaign of terror against the Jewish people is savage. The torture of hostage Gilad Shalit was savage. The bloody hacking to death of the Fogel family was savage. The Munich Olympic massacre was savage. The unspeakable torture of Ehud Goldwasser was savage. The tens of thousands of rockets fired from Gaza into southern Israel (into schools, homes, etc.) are savage. The vicious Jew-hatred behind this genocide is savage. The endless demonization of the Jewish people in the Palestinian and Arab media is savage. The refusal to recognize the state of Israel as a Jewish state is savage. The list is endless. 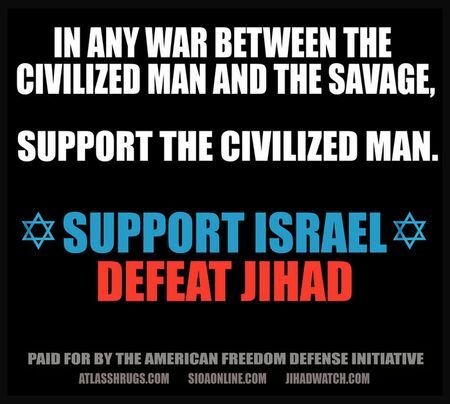 By using the term “jihad” in the context of a war against savages, the ad paints Islam as inherently violent, evil and bent on overthrowing the Western democracies and their key ally in the Middle East, Israel — even though, for the vast majority of Muslims, “jihad” refers to a spiritual quest, not the more politicized idea of holy war. Yes, these ads are lawful. But they are wrong and repugnant. What other purpose can they have but to incite hatred against Muslims? the legal, compulsory, communal effort to expand the territories ruled by Muslims at the expense of territories ruled by non-Muslims. Pipes does recognize variant, more benign meanings. But to say that the “vast majority” of Muslims perceive it as a spiritual quest is silly. Even if the vast majority does not participate in violent jihad, hundreds of millions support it and all understand it. The Obama administration removed the word ‘jihad‘ and others relating to Islam from the National Security Strategy document in 2010 for the same reason that Jacobs wants these ads gone: Muslims don’t like it when it is suggested that more and more Muslims today are becoming radicalized, supporting the attempt to expand the territory under Shari’a. There is a debate over whether violent radicalism is inherent in Islam. This is stupid: Islam doesn’t have to be anything other than what Muslims think it is, and the fact is — as should be evident from the daily news broadcasts — that more and more Muslims think it should be radical and violent, and that radical Islamist regimes are replacing conservative ones all over the globe. Calling attention to this isn’t inciting hate against Muslims — it is asking for us to realize that there is an enemy of what we call Western civilization, an enemy that has already showed us its savage side on 9/11 and in the Middle East, an enemy that does not want to coexist with us but wants to replace our civilization. This enemy is radical Islamism, an ideology associated with a religion, but no less an ideology than communism and fascism. Rabbi Jacobs would like us to believe that the ‘vast majority’ of Muslims are just like Reform Jews, except that they say “allahu akbar” instead of the shema, and he would like the others to be invisible. But it’s not rational (or safe) to ignore them, even if it were possible to ignore the open sewers of hate speech pouring from the media in Egypt, Iran, the Palestinian Authority, etc. ; the rockets falling on Israeli towns (559 so far in 2012); the vicious threats from Iran to destroy Israel; religious wars, terrorism and more. New York, June 12, 2011- The Board of Trustees of the Union for Reform Judaism today unanimously and enthusiastically elected Rabbi Richard Jacobs to serve as its next President. Only the fourth person to hold the office since its creation in 1943, Jacobs follows Rabbis Maurice Eisendrath, Alexander Schindler and Eric Yoffie. Rabbi Jacobs currently serves as Senior Rabbi at Westchester Reform Temple in Scarsdale, NY, and will assume the URJ Presidency in 2012. The fourth person to hold this office, Rabbi Jacobs is also the first to be a member of J Street’s Rabbinic Cabinet and a board member of the New Israel Fund (NIF) — organizations which are, despite their denials, anti-Zionist. He is also the first to take part in a demonstration against Jewish sovereignty in eastern Jerusalem. The unanimity and enthusiasm of the Board is noted. It’s not unimaginable that at least one of them was a little uneasy, but kept quiet for shalom beit. Let’s hope so. One hundred Reform Jews purchased advertisements in Jewish publications to oppose Rabbi Jacobs. You can see one of them here. What are we, chopped liver? Plenty of Reform Rabbis and professionals agreed with us too, although I expect some were intimidated by the threats to their livelihoods coming from Rabbi Jacobs’ supporters. This really is the essence of the problem: A self-appointed elite that has defined “the movement” as only those that share their political perspective. As Rabbi Jacobs winds down his responsibilities with Westchester Reform Temple, he also will step down from his involvement in other organizations, boards and advisory committees during the first years of his Presidency in order to focus his energies on the task ahead of him. Additionally, as President of the URJ, he will assume many new official posts on Jewish communal organizations including the Conference of Presidents of Major American Jewish Organizations, the Jewish Agency for Israel and the American Israel Public Affairs Committee, among others. Presumably this means that he will give up his positions with J Street and the NIF for a while, but may return to them later, when things quiet down. Is this supposed to make his critics feel better? Our problem is not his workload! How about a statement that as President of the URJ he understands that it is inappropriate for him to belong to — let alone take a leadership role in — these organizations? As I wrote a few days ago, this appointment is a triumph for J Street, who now can inject their pernicious point of view into multiple mainstream Jewish organizations. First, I stand squarely in the tradition of Rabbis Schindler and Yoffie, that I will never, ever compromise on Israel’s security, never. I will ever lift up our efforts to strengthen it as a Jewish and democratic state, and that I will be proud to work to advance the Israel policies that this Movement has adopted over the past generations. Second, and just as important, I hope that when the time comes for such a debate, that it will be a machlochet L’shem shamayim – a dispute for the sake of heaven…that we will conduct that debate with passion, to be sure. I hope and pray we will always debate with passion — but with civility and a respect for those who hold differing views. I hope we will work to learn what others really think, and have really said, rather than relying on rumors, half-truths and outright lies. I hope that we will talk about real issues, and not find people guilty by association. I hope that anyone who wants to know what I think about something will ask me. As you will learn, I’m not exactly shy. As his supporters have done, Rabbi Jacobs himself takes the low road. I certainly haven’t, in any of my posts about his nomination, relied on “rumors, half-truths and outright lies” or told any of them. I challenge Rabbi Jacobs to come up with even one. And I have not tried to divine what is in his mind. I have simply pointed out that he is an activist in two organizations that I and others have documented, over and over, as taking positions inimical to the state of Israel. I was seen having a beer with Tony Soprano. Therefore I must be a member of the Mafia. Agreed, unsound reasoning. Guilt by association. But what about this? Rabbi Jacobs has a leadership role in J Street. Therefore Rabbi Jacobs supports, in general, the actions and principles of J Street. That is a much better argument, isn’t it? Sure, he will say that he doesn’t agree with all of their actions. But unless he agrees with most of them, why would he be a part of it? What is there about an organization that lobbies for the US to allow a motion condemning Israel to pass in the security council, that lobbied against a congressional letter condemning incitement in the official Palestinian Authority media and the naming of public squares after terrorists that killed Israeli children, that introduced the author of the Goldstone Report to members of Congress and supported the Goldstone report that accused the IDF of war crimes, that applauds the Hamas-Fatah pact, that lobbied against a congressional resolution calling for sanctions on Iran, that called for an immediate cease-fire on day 1 of Operation Cast Lead while the Qassams were raining down on southern Israel, whose co-founder thinks that the creation of Israel was a mistake, that takes money from a former president of the Arab-American Institute, a Turkish maker of antisemitic films, and the self-proclaimed anti-Zionist George Soros (and lies about it) — what is there about J Street that you don’t understand? Item: the Jewish Community Relations Council (JCRC) of Greater Boston, in a controversial vote on May 25, decided to keep J Street as a member. The JCRC of Hartford, Connecticut is co-sponsoring an event with J Street on June 13th, despite community opposition. Item: the University of Pennsylvania Hillel allowed J Street to hold the kickoff event in February for its new local network in its space; the Harvard Hillel cooperated with J Street U (downloadable video) to host Breaking the Silence in March; and the Columbia-Barnard Hillel hosted a “Bagel Brunch” with J Street of NYC this month. Item: the Union for Reform Judaism (URJ) has nominated, and despite protests will probably confirm, J Street and New Israel Fund activist Rabbi Richard Jacobs as its new president. In all of these cases the argument was made that J Street represents a legitimately pro-Israel point of view — dovish, left-wing, perhaps, but nevertheless pro-Israel. A point of view that might be taken by someone who wants Israel to survive and thrive, but disagrees with the policies of the present government because they are too ‘hard-line’ toward the Palestinians. A point of view that belongs ‘in the big tent’ with other shades of Jewish opinion. A ‘loyal opposition’, so to speak. After all, there are plenty of Israelis that disagree with their government, too. In the 30 posts that I’ve written about J Street I’ve argued that this is not the case. I’ve argued that there is direct evidence — J Street’s official positions and their lobbying activities — that show that J Street acts against the interests of the Jewish state. Lobbying for a security council resolution condemning Israel, in favor of the Goldstone report, against sanctions on Iran, even against a congressional letter denouncing the continuing Palestinian incitement to hatred at the time of the vicious murder of the Fogel family, cannot possibly be construed as ‘pro-Israel’. There is also indirect evidence that J Street is actually an anti-Israel organization: the fact that it has received funds from individuals and groups that are anything but pro-Israel, like the former president of the Arab-American institute and anti-Zionist George Soros (about which they lied for at least a year). Further evidence is the fact that J Street invited anti-Zionists and supporters of boycott-divestment-sanctions to speak at their convention, where they received enthusiastic applause — including the vicious Egyptian journalist Mona Eltahawy. I will go as far as to say this: the J Street leadership is consciously aligned with Israel’s enemies, even if some of its uninformed supporters still think of themselves as merely pro-Israel peaceniks. Its true goal is not to make Israel ‘better’, but to help replace it with an Arab state. A recent poll shows that the great majority of American Jews do not agree with J Street’s point of view. Nevertheless, the strategy of infiltrating mainstream Jewish organizations like JCRCs and campus Hillels is proving to be a highly effective way to amplify a fringe ideology — indeed, an ideology which is exactly the opposite of what it claims to be. The nomination of Rabbi Jacobs to head the URJ represents the opening of an entirely new chapter in the saga, because there are more Reform Jews in America than any other denomination. Several Reform rabbis that I talked to indicated that they were blindsided by the vehemence of the opposition to Rabbi Jacobs from pro-Israel Reform Jews. It may sound odd, but apparently many of them, concerned about financial and management issues in the movement, did not think to ask whether Jacobs’ position on Israel might become a problem! This may be so, but I’m certain that there is a well-organized group that was very conscious of ideology regarding Israel, and committed to getting their kind of candidate selected. The takeover of the URJ is perhaps the greatest triumph yet — Jacobs is certain to be confirmed — for the strategy of infiltration. 1. The URJ leadership doesn’t get it. Reportedly, a member of the search committee said that the discussion was all about Rabbi Jacobs’ organizational and leadership ability. It did not occur to them that his politics regarding Israel might be a problem. Insofar as this is the norm among Reform rabbis, it’s not surprising that the committee didn’t find anything wrong with it. But grass roots Reform Jews do put a high priority on real support for Israel. 2. The URJ leadership is a bunch of bullies. By setting the battle lines in the way they are currently doing, Rabbi Jacobs’ critics are sailing in very dangerous waters. They argue that any demurral from the current party line of Israel’s government is disloyal. If this position prevails, the plague of separation will reach epidemic proportions. The advertisement did not make any such ridiculous argument. But that’s not the point. This, and the tone of the entire response, is meant as a warning to Reform rabbis. Don’t sign on to this right-wing extremist campaign, they are told, or you will be marked as carriers of the ‘plague of separation’. You will be sailing in dangerous waters. Your ad and your names won’t be forgotten by myself and others. Like other Lashaon Hara behavior, your words will reflect on your reputation and will be remembered when you write a paper, present a lecture or look for a position on a committee or employment. As a blogger, I love it when some self-important prick shows how stupid and vicious he really is. But imagine how this reads to a Reform rabbi who is considering speaking against Rabbi Jacobs’ confirmation! The employment situation for rabbis is difficult today, with many institutions cutting back, others merging, etc., and the URJ plays a critical role in the placement process. Dangerous waters indeed. 3. The confirmation of Rabbi Jacobs would be a bad for Israel and bad for the URJ. It is not “nuance” when J Street calls for the US to support a Security Council resolution that condemns Israel, nor when it arranges appointments for Judge Goldstone to meet with US Congress members, when it opposes a Congressional letter calling for sanctions on Iran, applauds the union of Fatah with Hamas, sponsors a speaking tour by the anti-Israel John Ging of UNRWA, invites boycott-divestment-sanctions advocates to present at its national convention, etc. Here’s still more nuance: the New Israel Fund (NIF) funds organizations that call for boycott-divestment-sanctions of Israel, Israeli Arab groups that want ‘de-Zionization’ — the conversion of the Jewish state into a ‘state of its citizens’ — as well as the NGOs that provided the majority of the false ‘evidence’ cited by the libelous Goldstone report, and that engage in ‘lawfare’ against Israel. Words do have meanings. Is any of this part of the meaning of ‘Zionism’ or of love for Israel? I don’t think so. Israel is probably in as much existential danger today as it has been at any time since 1948. Pro-Israel Americans take their cues about policy toward the state — and politicians their excuses — from the Jewish community. This appointment is critical. Remember that the search committee decided on Rabbi Jacobs because they saw in him a leader who could bring the Reform movement into the 21st century. Both sides of this growing debate would do well to remember that there are, after all, bigger issues at stake for a denomination whose numbers have been quickly dwindling. We need to reconsider our core religious messages. We need to emphasize observance — however we decide to define Reform ritual and ceremony. And we need to do this urgently, before an entire generation slips away from us. This also means that we can’t afford a costly debate over what is essentially an irrelevant issue from an organizational point of view. But grass-roots Reform Jews are telling them that Israel is not irrelevant. Polls indicate a high degree of support for Israel among Jews (most of these are Reform Jews or ‘just Jews’ who tend to be less supportive), even if Reform Rabbis don’t share it. If the movement moves in the opposite direction from its membership, then problems will get worse, not better.